The Galileo ExpressCast 2340 horizontal gel box is a high sample capacity system that also has a long run length for maximum resolution of complex analytes. 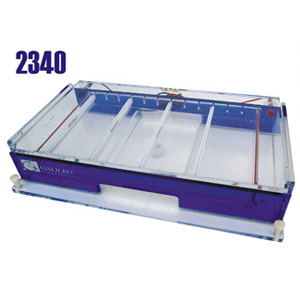 If your electrophoresis requires a high v0lume of samples, as well as a long run length for maximum resolution, then look no further than the ExpressCast 2340 gel box. This unit includes the Galileo's ExpressCast gel casting system for fast, tape-free gel pouring. The 2340 is our maximum capacity system that Galileo offers, with a maximum run length of 40cm and a maximum load of 600 DNA or RNA samples. This allows the 2340 to provide a very high resolution of complex analytes as well as very high sample throughput with the tray's 12 comb slots. The 2340 features the Galileo ExpressCast gel casting system for quick, tape-free gel casting and includes a built-in bubble level and leveling screws for convenient level adjustment. Galileo also offers a wide variety of comb options to customize your order. End gated 23cm wide x 40cm long ExpressCast UV-transparent gel tray with built-in fluorescent ruler and 12 comb slots. Choose among these accessories to customize each system for your specific needs. Gel loading guides. These guides fit into the comb slots of the gel tray, and have precision machined slots that provide accurate aligning of your multi-channel pipette during during gel loading.